Where? That set of steps you see leads up from New Bridge Street into a small lane known as Pilgrim Street. The view from the other end is equally impressive, with the wedding-cake tower of St Brides framed by office buildings. What? Because much of its course is open to vehicles, this narrow route behind the CityThameslink building only partly qualifies for our column on account of the pedestrianised western end. It leads into an extended network of ancient alleyways to the south west of the cathedral. Why use? 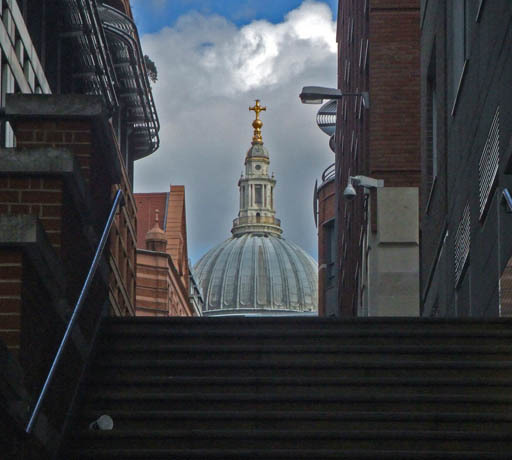 Certainly, it's a good spot to impress visitors to the city, with the dome of St Paul's rising above the steps. All very Oliver Twist, but without the filth and petty theft. It's also a crafty means of getting into the Thameslink station without having to fight through the hordes on Ludgate Hill. Also good for? Budding archaeologists. The Roman city wall is presumed to have crossed Pilgrim Street on its way down to the Thames. However, no remains have ever been found along this stretch, so perhaps there's a major archaeological find just waiting to happen. In Medieval times, the wall was rebuilt and actually ran the length of Pilgrim Street, as this superb map shows.